Comments: No other Kansas hawk hunts with the low-level, buoyant, darting flight characteristic of the northern harrier. However, its flight is similar to the flight pattern of the short-eared owl. Both can be found hunting open grasslands and marshes. The harrier is the only hawk with an owl-like facial disk. This dish-shaped face probably assists the birds in hearing small mammals rustling through the grass. Male and female northern harriers differ greatly. The males are mostly pale gray with a white rump and the females, approximately 50 percent larger, are mostly brown with a white rump. Distribution: They are found in all of North America except the most northern parts of Canada and Alaska. Northern harriers are commonly found in Kansas throughout the winter months and occasionally remain through the summer to nest, on the ground, in fields, grasslands or marshes. 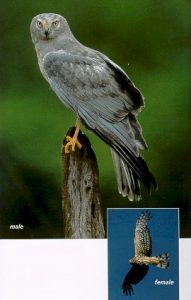 Food: Northern harriers usually feed on small to medium-sized mammals found in open vegetation. They will also capture ground-nesting birds, snakes, lizards, frogs and grasshoppers.